The dirt road winding to Loma Vista Ranch is as rough as I remember. Each mesquite and scrub oak looks to be just as it has always been, hanging on despite droughts and down turns. The next bend in the road brings into view the gentle slopes of Loma Vista hill, meaning "hill view" in Spanish, the highest point around Batesville, Texas in rain-starved Zavala county in harsh South Texas brush country. According to stories passed down through the years, the lone hill once had a fort and was used by Spanish explorers traveling the Upper Presidio Road. Legend has it French explorer La Salle camped on Loma Vista hill in the early 1600s. A wine bottle shard and stone seal found near the hill, dated from the 1600s with a French Medoc imprint, adds credence to the legend. Nothing is up there now except rattlesnakes, rabbit nests, Indian artifacts, and perhaps a few unrepentant spirits. John Quincy Adams, Jr., my uncle, has nearly 1,000 arrow heads and spear points he found on his ranch, many of them discovered around Loma Vista hill where Indians had camped. The ranch is small by Texas standards. Only 640 rugged acres of sun-baked terrain remain of the ranch founded in 1882 by Uncle Quincy's grandfather, Jesse Adams, 17 years after he came to Texas when the War Between the States ended in 1865. 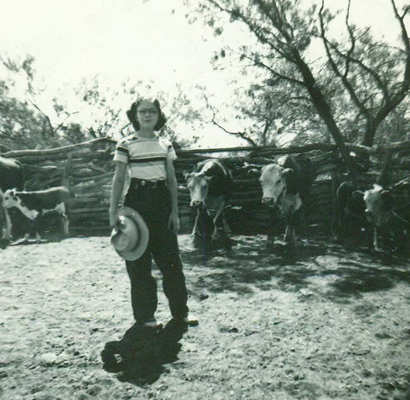 Jesse and his wife, Lucie Jane, as well as many other Southerners, heard Texas was a good place to make a new homestead start after losing plantations, farms, and family in the devastation of the War. Jesse had been a scout for the Confederate Army along the border of Missouri and North Arkansas. As a result of his service in harsh conditions, his health had been damaged and he died at age 48 at Loma Vista. Before the War, Jesse's father, Peter F. Adams, had been a prosperous plantation owner in Arkansas. 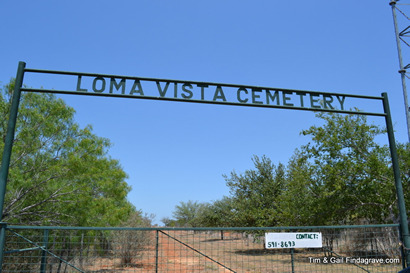 But Loma Vista was far too dry, too rough, too inhospitable to offer much prosperity to those bold or reckless enough to ranch against such odds. My rental car makes a sharp turn and flushes two mourning doves from the dry grass at road's edge. A dove's head is small in comparison to its plump gray body, but the most remarkable feature is its soft, mournful cry. "What do you want, shepherd boy?" "To eat berries, to eat berries." At the next turn, a small ranch house with a porch across the front comes into view. Uncle Quincy built the four-room rough cedar ranch house after he decided the seven-room house nearby, built in the 1800s by his family, was too big. He also built the heavy wooden table and chairs in his kitchen. An old, wood-burning cast-iron cook stove squats in the kitchen and a silver stovepipe runs from the stove to a hole cut high into the outside wall. In sharp contrast to the once imposing but long abandoned white house nearby, the cedar ranch house is plain and rustic, but it has warmth, promising welcome for those who enter. Uncle Quincy tells a story about a relative visiting the Chicago World's Fair in 1893. Not only did the relative see the new invention called electric lights in Thomas Edison's prominent exhibit, he also paid 10 cents to have his fortune told. The fortune teller told him he lived in a big house with a kitchen about 40 feet back from the main house. Under that kitchen, she said, were four or five rocks arranged in a circle around a larger rock. If he would dig up the center rock, she assured him, he would find Wells Fargo pouches filled with gold. Everyone back home laughed at the story and it was told around for nearly 30 years. Then the kitchen burned down, and sure enough, there were four rocks around a larger rock. Apparently no one bothered to dig up the rocks before the kitchen was rebuilt, and Uncle Quincy does not intend to do so either. When asked why, he replies, "Well, that gold if it's there, doesn't belong to me. It belongs to Wells Fargo, or the government would claim it ." He says if he found gold, people would come out to the ranch, upset the livestock and give him trouble. "They would tramp all over the place, and I would be questioned, bothered, and have to fill out all kinds of forms." For years I told him that what is really under the ranch is black gold, oil. He laughs at that. "Water is more important than oil around here," he says. "Cows can't drink oil." When I arrive, Uncle Quincy isn't in the ranch house, so I head down to the corral. But first I kick off my high heels and pull on a pair of well-worn boots, comfortable old friends custom-made when I was a teenager. Uncle Quincy and a Mexican ranch hand are in the corral, and curses in English and Spanish can be heard for half a mile. A new bull they're branding has tried their patience. When Uncle Quincy sees me, he saunters out of the corral, minus the curses, and says, "I swear to my time, you sure don't let anyone know when you're coming do you? Stovepipe, how are you? Let me look at you, it's sure good to see you." I was 7 years old when he gave me that nickname because he said I was tall and skinny like a stovepipe. He believes young girls in Texas require affectionate names more suitable than the ones given by their parents. His own two girls he calls Janie Bird and Bird Legs. "Come here, Stovepipe, and hug your broken-down old uncle's neck." He wraps me in a bear hug I manage to return once I catch my breath; then he steps back to look at me. I see he has a two or three days growth of beard with a touch of gray. He is still tan and lean, but more weathered than I remember. He has on ancient leather chaps he has worn ever since I can recall, mostly to protect him from mesquite and cactus thorns when he rides horseback. But he doesn't ride horses much since Tiger died. Now he rides an old Jeep more than he rides a horse. 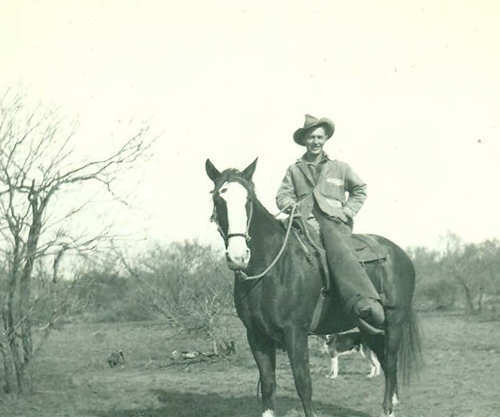 "Uncle Quincy on his Arabian/Quarter horse, Tiger." Stovepipe - "Age 10 or 11 waving one of Uncle Quincy's hats as I pen several white faced Hereford cattle in the corral." Tiger, an Arabian/Quarter horse mix, had been his beloved horse for 26 years. No one but Uncle Quincy rode Tiger because no one could tell when Tiger would take a rare notion to pitch. Many horses will lay their ears back or bow their necks or give other dependable sign of impending deviltry, but not Tiger. Tiger is buried in a clearing near the corral, and I notice a well-worn path leading to the area. Uncle Quincy sees me glance toward the path and says, "Yes, I pay a visit 'most every day. Don't want him to feel abandoned and I want him to know I'm still alive and kicking." He's finished at the corral and ready to go to the house and have a beer. At the house, he opens a cool one, props his boots on the porch rail, and pushes his sweat-stained Stetson back on his head. "Well, how have you been, Stovepipe? What's a big city girl doing out here in the sticks? Tell me all about it." We talk until after the sun goes down. He listens intently when I tell him what's going on, and he offers good advice, honest wisdom that will stay with me all my life. Then he fries a chicken in a black cast- iron skillet, on the same wood stove I last cooked on when I was 13 and electricity had not yet come to the ranch. We have crisp chicken with buttermilk and yesterday's corn bread, real Southern comfort food. When the key-wind clock on the mantle strikes 11 p.m., Uncle Quincy says it's time to turn in. The bed and comforter in the front room are made of down so warm and soft I barely have time to listen to the rare gentle rain on the tin roof and the distant song of coyotes before I fall asleep. During the night, the clank of the windmill, when the breeze shifts directions, drifts into my sleep, bringing a familiar reassurance from my childhood that all is well. This is home. The sun is up when the smell of bacon and biscuits wakes me. When I enter the kitchen, Uncle Quincy is squatting in front of the wood stove, taking golden biscuits out of the oven. He glances around and says in mock disapproval, "Thought you might sleep the whole day away, Stovepipe." He has on a clean, long-sleeved, blue shirt and pressed khaki pants. He looks like the actor Paul Newman, except Uncle Quincy is more rugged, an outdoorsman, a real cowboy. I notice he has shaved. His code of conduct for a gentleman does not deem it proper to be unshaven in front of guests, especially not women. During breakfast of hot biscuits, fresh butter, mesquite honey and bacon, we laugh and talk about the good times on the ranch when all the family were still around. I look at his honest, sun-baked face and know how lucky I am to have an Uncle Quincy who still forsakes crowded cities, still calls a grown woman Stovepipe, and lives by his own honest rules just as the real-life cowboy he is. Some writers, such as Larry McMurtry, have insisted the Code of the West is a myth, but McMurtry has done very well writing about such men. And Uncle Quincy is proof such men are not a myth. Too soon it's time for me to leave. The saddest moments in life are those of leaving, sad because you know you may not return, or when you return the one you love may not be there. It's the latter I fear more. As long as Uncle Quincy is here I can always go home again. He will always put out his arms and call me Stovepipe, but the day will come when he will do these things only in my memory and I hurt with the pain of knowing. Uncle Quincy is looking closely at me. "You're thinking like a tree full of owls, Stovepipe. Never saw anyone think as much as you do, even when you were a kid." He's aware of what I'm thinking and he's trying to make leaving easier. Walking to the car, he tells a humorous story about one of his longtime neighbors, John And Mary Powell, but I don't hear much of it because I'm storing up the sight of him and the feel of the rough South Texas brush country that is so much a part of both of us. He opens the car door, hugs me, steps back and closes the door. I must leave quickly. Waving good-bye, he calls out, "Watch where you put your boots, Stovepipe." How often I've heard his warning and how often it has come back to me in moments of uncertainty. Driving the dirt road leading to the highway headed back to Houston, I still hear his warning in my mind. But also I hear something else. I hear a mourning dove grieving in a mesquite tree, "Adios pastor, adios pastor." Old age caught up with Uncle Quincy, and he died in 1997. The ranch was sold, including mineral rights although Uncle Quincy always preached to us, "You may have to sell land, but never sell your mineral rights." Before he died, he had experts check the ranch for oil and minerals. The experts assured him: no oil, no uranium, nothing of value. Uncle Quincy is buried in the red dirt of Loma Vista cemetery with his ancestors. 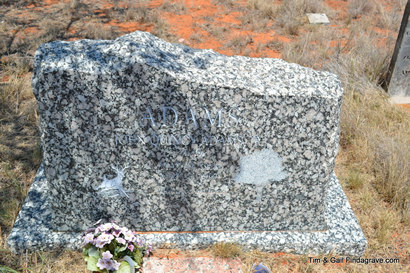 The inscription on his chunk of granite headstone has a carved deer and a mesquite tree and the words, " Looking Toward Home." John Quincy Adams' granite headstone at Loma Vista cemetery. In his life he fought drought and dry water tanks, with cattle dying of lack of water and forage in the 1950s. He lived through the Great Depression. He served in WWII and built the landing strip for the American pilots flying "The Hump" to Burma. Then he returned home to Loma Vista. At the end, he lived alone on the ranch and worked it mostly by himself. He died long before the current Eagle Ford Shale and fracking brought the promise of oil and gas riches to Zavala County. I wonder what he would think now if he knew about the buried treasure under the ranch. I can just see him slapping his worn old Stetson on his knees and saying, "Well, I swear to my time, Stovepipe, I swear to my time!"